Although this image might at first look like abstract modern art, it is in fact the result of a long camera exposure of the night sky over the Chajnantor Plateau in the Chilean Andes. As the Earth rotates towards another day, the stars of the Milky Way above the desert stretch into colourful streaks. The high-tech telescope in the foreground, meanwhile, takes on a dreamlike quality. 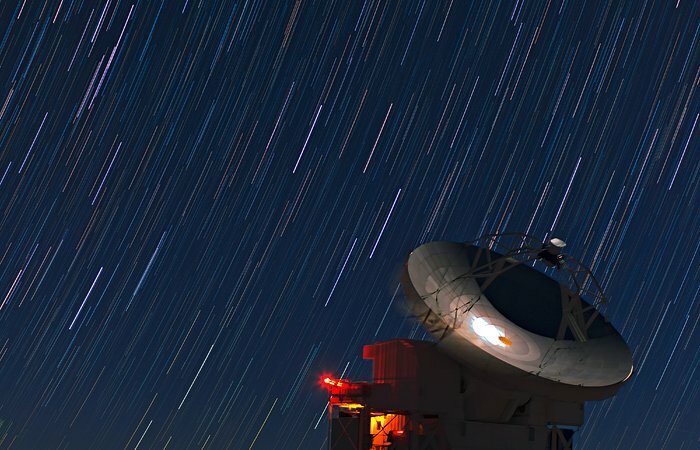 This mesmerising photo was taken 5000 metres above sea level on the Chajnantor Plateau, home of the Atacama Pathfinder Experiment (APEX) telescope, which is seen here. APEX is a 12-metre-diameter telescope which collects light with wavelengths in the millimetre and submillimetre range. Astronomers use APEX to study objects ranging from the cold clouds of gas and cosmic dust where new stars are being born, to some of the earliest and most distant galaxies in the Universe. APEX is a pathfinder for the Atacama Large Millimeter/submillimeter Array (ALMA), a revolutionary telescope that ESO, together with its international partners, is building and operating, also on the Chajnantor Plateau. When ALMA is completed in 2013, it will be an array of 54 antennas with 12-metre diameters, and an additional 12 antennas with 7-metre diameters. The two telescopes are complementary: thanks to its larger field of view, APEX can find many targets across wide areas of sky, which ALMA will study in great detail due to its far higher angular resolution. APEX and ALMA are both important tools to help astronomers find out more about the workings of our Universe, such as the formation of the stars seen wheeling overhead in this image. ESO Photo Ambassador Babak Tafreshi took this picture. He is also founder of The World At Night, a programme to create and exhibit a collection of stunning photographs and time-lapse videos of the world’s most beautiful and historic sites against a nighttime backdrop of stars, planets and celestial events. APEX is a collaboration between the Max Planck Institute for Radio Astronomy (MPIfR), the Onsala Space Observatory (OSO) and ESO. 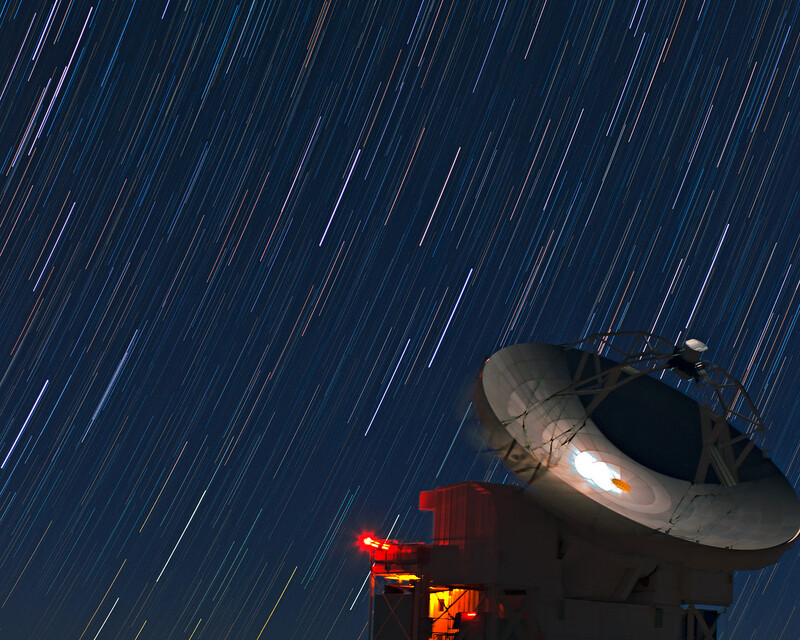 Operation of APEX at Chajnantor is entrusted to ESO. ALMA is an international astronomy facility, and a partnership of Europe, North America and East Asia in cooperation with the Republic of Chile. 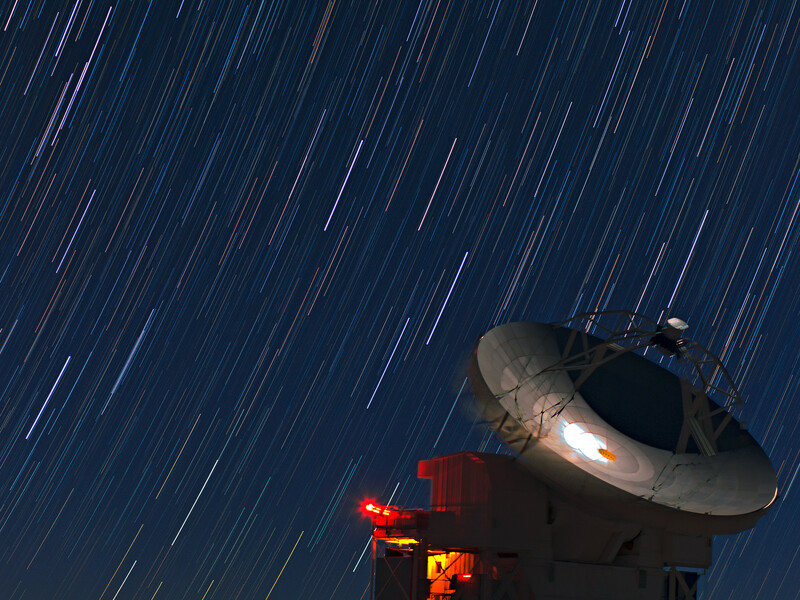 ESO is the European partner in ALMA.